Trip-ready: work/maintenance in the last 2 years includes: new batteries (starting and house), new tires, new Stainless steel exhaust system (except for cat. convertor), new propane tank, new clutch master cylinder, new windshield and front and rear wipers, brand new 3-way fridge, brake fluid replaced, most interior camper lights converted to LEDs. This van drives nicely and has the most power of any waterboxer-powered vanagon I have ever owned. 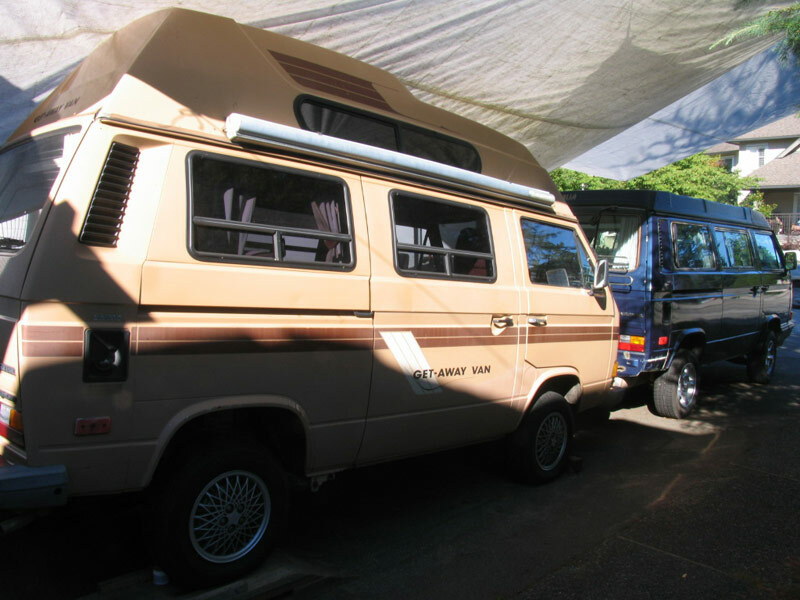 If you are looking for a well maintained original condition syncro high top camper, this could be the vehicle for you. I still need to take the van to a fiberglass repair shop to have the antenna hole (think that is what it must have been) repaired but that should be done in about a week. I will put up detailed photos and a price once I advertise on CL and thesamba, by the end of November for sure. If you are interested, I am open to offers. PS – I am about 1/2 finished cut polishing the van. Wow, the original paint was so flat and faded looking but with cut polish it shines like new. I couldn’t believe the difference. The factory really did do good quality paint work. Unfortunately the van has a section on the passenger side that was repainted and if you look at it in the right light you can see the colour doesn’t quite match up with the rest of the van, oh well :-).